Condominiums are appreciating faster than single-family homes, especially in markets experiencing job market growth or urban renewal. During the recession, condo values had been decreasing by 11.1 percent per year, while single-family home values decreased 6.5 percent per year. 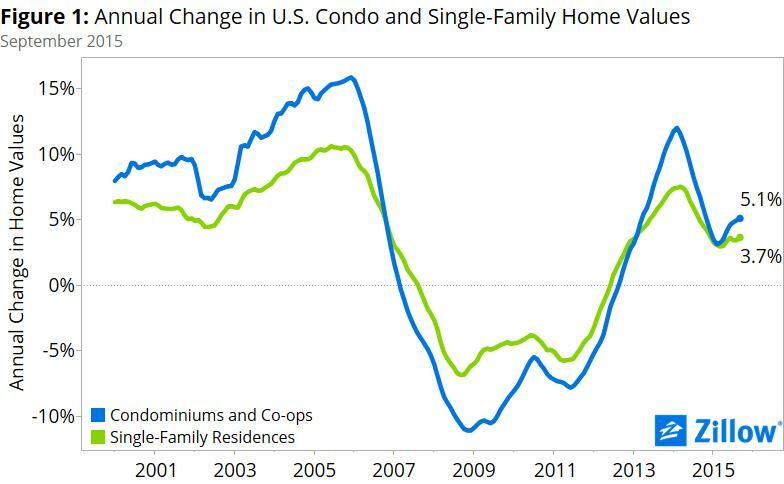 After suffering plunging values after the housing bust, condominiums are bouncing back. According to Zillow’s Real Estate Market Report for September, condominiums are appreciating faster than single-family homes, especially in markets experiencing job market growth or urban renewal. Condos are appreciating at a rate of 5.1 percent, compared to the 3.7-percent appreciation among single-family homes, Zillow said. During the recession, condo values had been decreasing by 11.1 percent per year, while single-family home values decreased 6.5 percent per year. But condos are outpacing single-family homes in value in nearly two-thirds of the country’s top 35 most populated housing markets, Zillow found. Condo values decreased year-over-year in only two cities, Zillow said: Baltimore, where values fell 2.3 percent to an average value of $187,500; and Los Angeles, where values decreased 0.2 percent to an average value of $439,800. Condos are appreciating at a rate of 5.1 percent, compared to the 3.7-percent appreciation among single-family homes. Gudell cautioned that buyers should consider some of the additional costs of owning a condo, such as homeowner association fees, when weighing their options. The data in Zillow’s Real Estate Market Reports are aggregated from public sources by data providers for 928 metropolitan and micropolitan areas dating back to 1996. Mortgage and home loan data are typically recorded in each county and publicly available through a county recorder’s office.